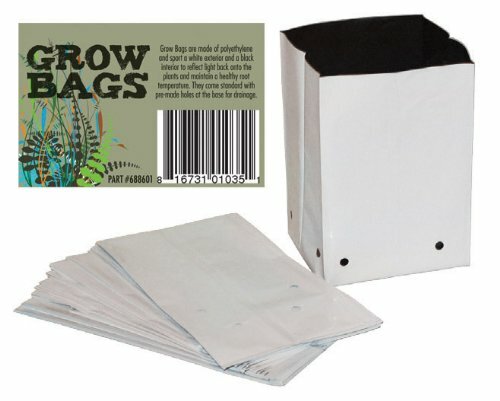 10 Gallon PE Grow Bag (packs of 200) by GROW1 at Tulips Orchids. Hurry! Limited time offer. Offer valid only while supplies last. 10 Gallon Black & White Polyethylene are made of lightweight, durable recyclable material. An inexpensive alternative to wasteful grow mediums. 10 Gallon Black & White Polyethylene are made of lightweight, durable recyclable material. An inexpensive alternative to wasteful grow mediums. Allows the end user to be eco friendly and pocket book friendly. White exterior for light reflection and black interior to prevent algae growth. Pre-made holes to ensure proper drainage. Available in 1, 2, 3, 5, 7 and 10 gallon sizes.